After 8 years of Governor Cuomo’s lofty climate talk only 4% of New York’s electricity comes from wind and solar. He continues to take money from the fossil fuel industry and build new fracked gas infrastructure, despite the facts of harm to health and climate, our protests and even civil disobedience. Below are Cuomo’s most blatant climate hypocrisies, collected in 8 categories. Share your stories on the topics most personal or frustrating to you. Include #CuomoWalkTheTalk and the hashtag for the category and your post will be featured on this page. In·frack·struc·ture noun, slang: Fracked/natural gas infrastructure such as pipelines and power plants. Though Cuomo banned fracking in New York, his administration has relied heavily on fracked gas from states like Pennsylvania and New Jersey. Despite Cuomo's denial of it (see video above), CPV and Cricet Valley Power Plants are among the many infrackstructure projects that his administration has approved. They are included in the 4 examples below that illuminate a spectrum of climate injustice among the 100’s Cuomo could shut down if he chose to. These bribes most likely helped to get the CPV fracked gas power plant built in Waywayanda, NY. Cuomo may think the situation is “very sad,” but ” - he’s still allowing the CPV plant to be built. Here’s further reading on the money circling between Percoco, Cuomo, CPV and Trump. Under Cuomo’s leadership, New York is failing to make progress en route to that goal: Wind, solar, and geothermal sources generate only 4 percent of the New York’s electricity. While investment in renewables is welcome and required, much more is needed. There’s also the question of how the money is being spent: For example, NYSERDA, an agency under Cuomo, “tasked with clean energy development subsidizes natural gas infrastructure,” such as natural gas powered trucks and fueling stations. Under Cuomo’s the New York State Public Service Commission enacted Value of Distributed Energy Resources (VDER) on March 9, 2017. Ostensibly the goal was to incorporate many factors including emissions and pass savings on to customers and utilities. Due to the extreme complexity of the VDER system it has actually put a halt on nearly all community solar projects in both city and rural settings. It replaced Net Metering a much simpler solution that worked for local solar projects. The Governor forgot to brag about previous exploits at sea: His administration oversaw the construction of the Rockaway Lateral Project, a “giant 26-inch diameter pipeline” that was pushed through after Hurricane Sandy when the lower income Rockaway community was focused on rebuilding and taking care of those who’d lost homes, property, livelihood and even community members, a textbook example of environmental injustice. Yet Cuomo did not rally the resistance to fight the pipeline; instead, 8 permits/clearances were approved by NY state. Just weeks after the hurricane, special legislation was even passed in DC, without a protest from Cuomo, allowing the pipeline to pass under the park, the Gateway National Park, which he had gifted to the country. However, if Cuomo is serious he could still stop the new expansions of the project referred to as the Williams pipeline. Our progressive climate demands are out of reach in NY because the State Senate is controlled by Republicans. Governor Cuomo has reportedly assisted and even encouraged the situation through Independent Democratic Congress, better known as the IDC: A group of 8 Democrats that caucus (vote) with Republicans in the State Senate. 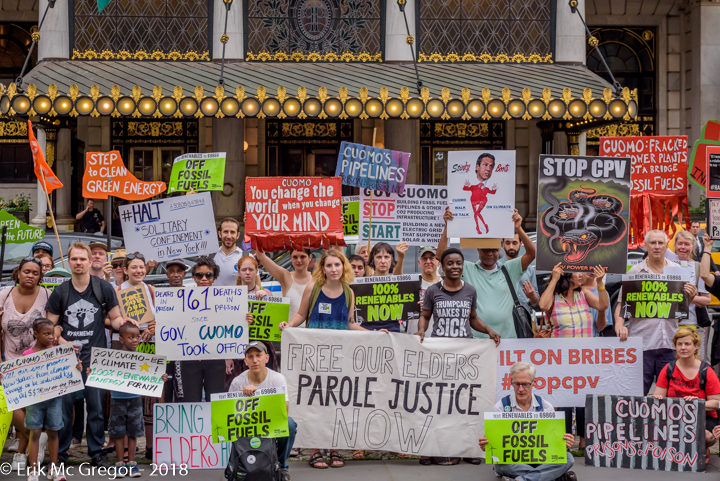 One of the core demands of #CuomoWalkTheTalk is a just transition to 100% renewable energy. The CCPA is an example of NY State legislation focused on this goal, that has passed the state assembly three times and is co-sponsored by a majority of State Senators yet is still not law, because the Senate’s president is Republican John Flanagan and he does not allow the bill to come to a vote on the state senate floor. This is possible in a state dominated by Democratic voters because of the IDC and Cuomo’s apparent interest in a divided legislature. On May 3, 2017 when asked if New York would be better off with an all Democratic state government Cuomo did not respond affirmatively, “We’ve had a unified Democratic government in Albany… It’s not a hypothetical. We’ve had it. It wasn’t extraordinarily successful.” The NY Democratic Party that the Governor controls has not given money to Democratic State Senate candidates. Instead, the new plan assisted the Republican Senate to redistrict so that primarily Democratic metro area downstate votes are weighted on average 8.8% lower than primarily Republican upstate districts which translates to a likely two vote swing in favor of the Republicans in addition to the 8 IDC turn cloaks. Further solidifying disproportionate Republican control of the senate in a “dark blue” state. Click to read more. In 2014, with the threat of Zephyr Teachout gaining the support of Working Families Party (WFP) in her primary challenge, Cuomo made a deal with WFP. In exchange for their endorsement Cuomo promised to retake the senate. When 2014 results came in the WFP had kept their end of the bargain, but Bill Lipton WFP Political Director did not think the reverse was true, “Governor Cuomo promised to take back the State Senate, Instead, he squandered millions on a fake party, and left millions more in his campaign account as New York Democrats in the legislature and in Congress withered on the vine.” To add insult to injury the State's Democratic Party, that Cuomo controls as Governor, did not give any money to State Senate campaigns. The CCPA stands for the: Climate Communities Protection Act, spearheaded by NY Renews, a coalition of over 140 labor, community, environmental, and environmental justice organizations across the state. With Cuomo and the IDC yielding control to Senate Republicans the Governor proudly announced the passage of a constitutional amendment reforming the redistricting process, claiming “ once and for all end self-interested and partisan gerrymandering .” However, it actually did the opposite and handed final authority those Senators already in power writing the amendment. It received four failing grades from Professor Gerald Benjamin (who in 1993 was appointed by the current Governor’s father, Governor Mario Cuomo, as Research Director of the Temporary State Commission on Constitutional Revision) and Zephyr Teachout called it an “incumbent protection scheme” representing a glaring broken promise by the Governor . In 2012, the new redistricting process, assisted the Republican controlled Senate to pass new district maps that the Cuomo approved. Across 54, of the 63 total, Senate districts, representation in primarily republican upstate districts was, and still is, weighted a whole 8.8% greater compared to those districts in the primarily democratic NYC/Westchester. This is according to mean population deviation as reported by Common Cause a democracy watchdog organization as well as the National Conference of State Legislators . Cuomo was even sued in federal court , but emerged unscathed because the 8.8% was within the extremely tolerant 10% precedent and the judiciary’s disdain for intervening in partisan affairs. The plaintiffs contended this would account for a two vote swing , further solidifying the Republican control of the Senate in addition to the IDC members.